IDEA World...BlogFest...so awesome...much inspiration. I don't even know where to begin recapping what an awesome weekend it was, so I'll start by pimping your playlist. Let me explain: IDEA World is the largest fitness convention for fitness professionals, and as such, it gives fitpros like myself the opportunity to learn from the best. There were a wide variety of sessions to choose from, and I seriously wanted to take almost every single one, but I narrowed it down to the few I had time for. One in particular was (literally) called "Pimp My Playlist." 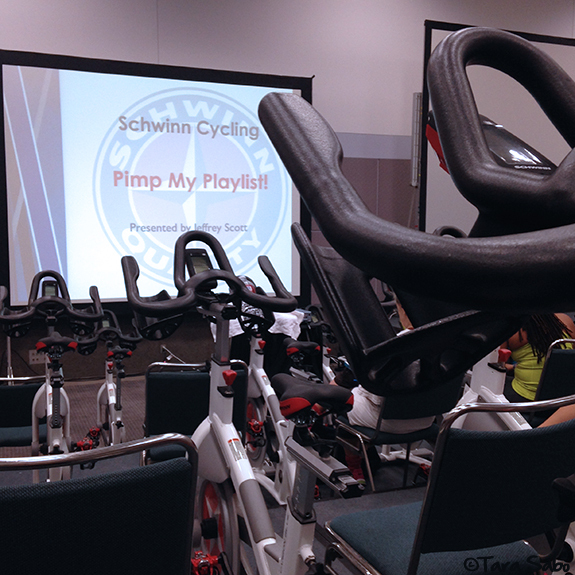 It was a cycling session taught by Jeffery Scott, a Schwinn Master Trainer and seriously playlist rockstar. To be honest: I woke up the day of my session less than motivated to jump on a bike, which is how I've really been feeling for quite some time now. Generally just burned out on the bike. But now, after taking this class, I'm newly motivated to ride. Renee came with me to the session. 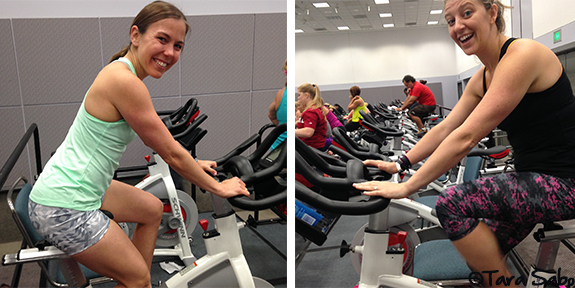 She was one of my roommates this weekend, and she's also a Spinning instructor. Man, we had fun. And we both learned quite a bit from Jeffery. 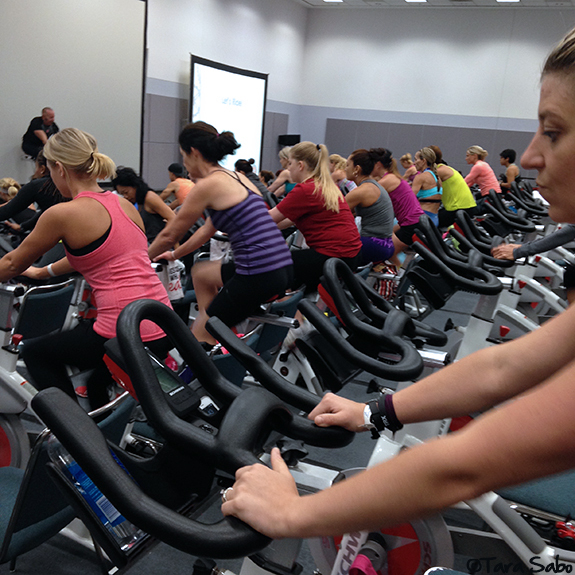 Main point: Music is the heart and soul of a Spinning class. It really is. If your playlist isn't good, if you aren't connecting with your riders, then the ride itself doesn't really matter. I'm not lying, every single song this guy played in our session made every single person in the room smile. And ride with heart. So, how does one pimp their playlist? How do you create a Spinning playlist that works? Let's take a look at some of the tips I brought home with me. 1) Appeal to a wide variety of people. Not everyone in your class will love the same exact music, so you need to offer some variety. This, of course, is true in any group fitness class. And it goes without saying that you need to put your personal taste in music to the side, because not everyone likes your taste in music either. 2) Surprise and delight your audience with a song they won't expect. Maybe it's something old that doesn't get played a lot, something nostalgic, or maybe a remix that turns into a crowd favorite. 3) Start at the bottom of the Top 100 list in iTunes. Why? Because everyone goes to the top when they search for music. What's at the bottom is still good and might eventually get up to the top. In which case, you'll be one step ahead. 4) Map your music. Know what happens when, and build your ride around it. Climb at the chorus, sprint when the music speeds up. 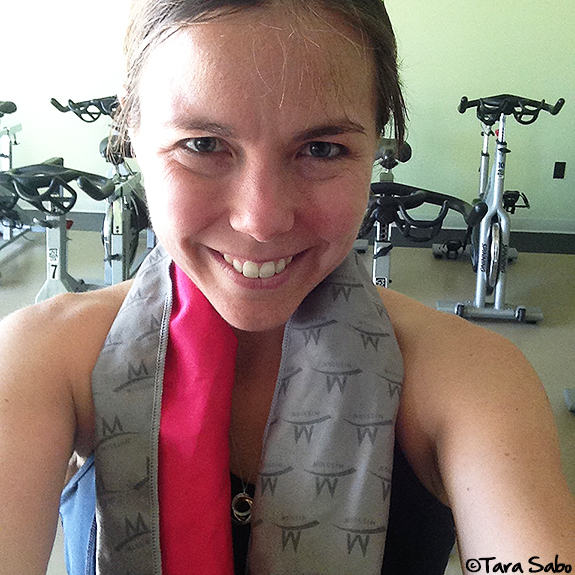 Don't just listen to the music when you ride, integrate it into your actions. 5) Pay attention to song order, contrast and transitions. Get this right and you'll take your students on a musical adventure that's so fun they'll forget they're working out. 6) Search beyond the original version of a song. Use words like "remix," "mashup," "dubstep," and even "cycling," or "workout." Because even if the song is all over the radio, it might sound differently when it's tagged with one of the above. And it also might change the song to a version that's easier to ride to. In the end, it's your class and you know your students. Appeal to their interests, do what feels right and appropriate and cue accordingly. You'll be successful, I'm sure. I taught class today using the playlist we had in class, plus a few extra songs to make it long enough. My students loved it. We rode hard, fast and ended up full of sweat. The towel? No, I didn't get that at the conference. I bought it yesterday at Meijer, although I hear they have them at Target, too. It's a cooling towel...one of the girls in my "Pimp My Playlist" class had one. I'm newly obsessed with it. 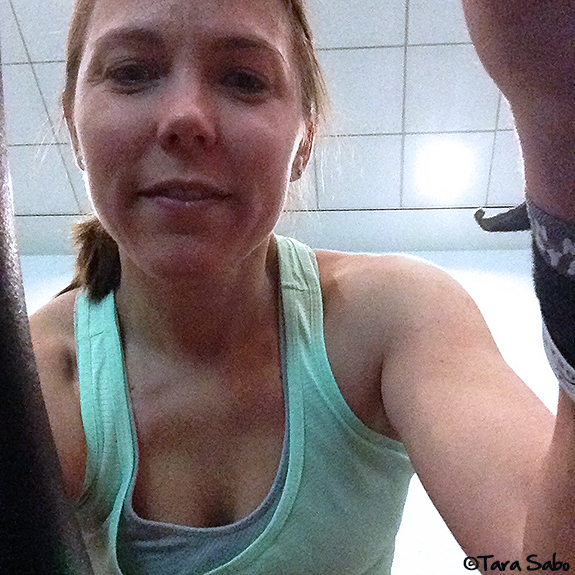 But, wait—what else did I learn at IDEA World and BlogFest? More to come. Question: What song seriously pumps you up? 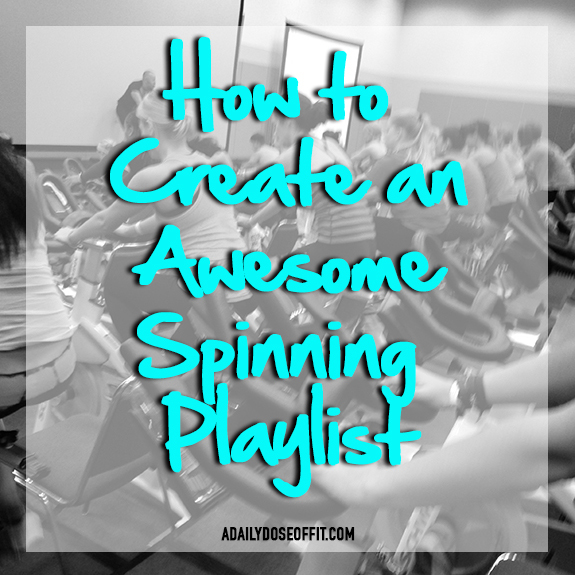 If you take Spinning classes, is there a song that you absolutely love to ride to?